It is that time of year again; Naja’s Place in Redondo Beach began their week-long 8th Annual IPA Festival on Wednesday afternoon. The event will feature well over 100 IPAs from around the country. We headed there early Wednesday afternoon as this was not my first rodeo, and Naja’s fills up fast every year as hopheads descend upon the International Boardwalk at the Redondo Beach Pier. On Saturday October 19, a fundraiser for Villa Chardonnay, a 501(c)(3) non-profit horse rescue operation in Temecula, CA was held at the Costa Mesa Fairgrounds in the form of The Ultimate Beerfest OC. The event was scheduled to have 20+ breweries, food trucks, a beer pong tournament and a Best of Show beer competition voted on by attendees that had VIP tickets. The Ultimate Beerfest OC was one of six scheduled beer festivals put on by the organizers with the others being scheduled for Los Angeles, San Diego, Pasadena, San Francisco and San Jose. The Los Angeles event was originally scheduled as the first but was postponed until 2014 due to logistical issues with the selected venue. When I first learned of the event, the Los Angeles venue was the one I planned on attending. When it was postponed I volunteered to cover the event in Costa Mesa. The event was scheduled to be held over the course of two sessions; the first beginning at 11:00 AM for VIP entries and noon for general admission and running until 3:00 PM with the second session running from 6:00 – 9:00 PM with VIP getting in an hour early. While the Ultimate Beerfest website specifically stated to “plan on arriving up to one hour early for event check-in” I really did not pay much heed to that suggestion as I have yet to attend a beer festival that had that many people show up; I kind of figured it was wishful thinking. It turned out that this was going to be bigger than I imagined. As you are probably aware, we are deep into the beer festival season; with multiple local beer festivals, Oktoberfest and the Great American Beer Festival all going on this week, I have one more to add to your itinerary. 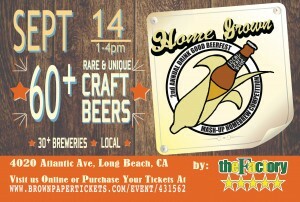 The Ultimate Beerfest-OC will be held at the Costa Mesa Fairgrounds on October 19, 2013. They are having two 3-hourlong sessions; the first from noon until 3:00 PM with the second one running from 6:00 – 9:00 PM for general admission ticket holders. All ticket holders receive a commemorative tasting cup while VIP ticket holders get in an hour early and get to judge the beer competition. In addition to the 20+ breweries represented there will be numerous food trucks and vendors (purchases not included with admission) and there will be the Ultimate Beer Pong Tournament, sponsored by Redhook Brewery. The beer pong tournament is limited to 64 entries per venue, so if interested in participating, I would recommend registering soon. Among the breweries scheduled to attend are Redhook Brewery, Manzanita Brewing Company, Firestone Walker, Latitude 33 Brewing Company, Kona Brewing Company, Widmer Brothers Brewing, Fox Barrel Cider, Mission Brewery, Blue Moon Brewing, Back Street Brewery, Jacob Leinenkugel Brewing Company, Rough Draft Brewing, Crispin Cider, Oggi’s Pizza & Brewing, Carlsberg Group, Crabbie’s Ginger Beer, Kronenbourg Brewery, Fireman’s Brew, Stadium Brewing Company, Surf Brewery, Old Orange Brewing Company, Aztec Brewing Company, Lost Coast Brewery, Batch 19, Oceanside Ale Works, and Tap It Brewing. This is a fundraiser for Villa Chardonnay, a 501(c)(3) non-profit horse rescue operation in Temecula, CA. There will be no tickets sold at the door so if you want to attend, be sure to buy your tickets ahead of time. I hope to see you there. Cheers! The 2nd Annual Drink Good Beerfest, hosted by The Factory Gastrobar in Long Beach, CA and sponsored by Cismontane Brewing and Beer Paper LA will be held September 14, 2013 from 1:00-4:00 PM at The Factory Gastrobar, located at 4020 Atlantic Avenue in Long Beach, California. This is actually a two-part event, so hopefully I get all the information correct. This craft beer festival begins with their 2nd Annual Drink Good Beer Mash-Up Homebrew Competition which is an AHA, BJCP sanctioned event. Thursday, August 22 is the final day for entries if you want to participate. The cost is $5.00 per entry and you must provide ten (10) 12oz bottles. Not all categories of beer are being accepted, so if you want more information, I suggest visiting The Factory website for all the rules. The winner gets to brew his entry with Evan Weinberg at Cismonte Brewing so that is pretty cool. The AHA/BJCP judging will take place on Sunday, August 25. On Monday, September 9 they will have their Best of Show judging and Craft Beer Guy was invited to be a judge for this, so I am looking forward to this opportunity.